Nonimmigrant visas allow a person to temporarily enter the U.S. When entering, admission record is created or updated by US Customs and Border Protection. It is critical that people check their I-94s and not allow them to expire. A person in the United States with an expired I-94 does not have legal status and risks removal, even if the visa in their passport is still valid. If the I-94 expires, he/she is no longer in legal status. If you are in the United States with an employment-based nonimmigrant visa or your employee is and that visa is nearing expiration, it is critical that you take immediate action. 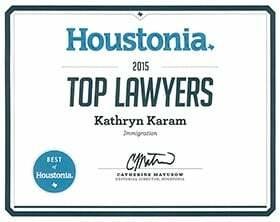 Kathryn Karam is an experienced Houston immigration lawyer who assists people and businesses to avoid going out of status. She works diligently to help employees and people in the United States on business extend their status or the allowed time for their temporary visits so they can stay here for the time required to get the job done. Kathryn Karam is a board-certified immigration attorney who helps people solve difficult problems. Nothing is too complicated for her to take on. Call (832) 582-0620 today to set up a consultation with Karam Immigration Law. Kathryn Karam assists people throughout the Houston area, including Bellaire, the Energy Corridor, Katy, Cypress, Tomball, The Woodlands and Baytown. There are many reasons an employee would need to extend his or her nonimmigrant status. To extend a status, the employee must be staying for the same reasons he or she came to the Houston area. For instance, if an employee came to work on a project on an L visa, he or she must be working for the same company, and his or her intent to only be here for definite period of time must remain the same. An employee can seek an extension of his/her nonimmigrant status even if his/her intent is to remain in the U.S. permanently if his/her nonimmigrant status permits dual intent, such as L, H, or possibly O or E. If his/her intent is to remain in indefinite employment, then the employee must also seek an adjustment of status to become a permanent resident. His or her passport must be currently valid, and must remain valid for the rest of his or her stay. As there are several different types of employment-based visas, the process used to renew the visa or seek an extension of a visa vary. Regardless of the type, though, it is always advisable to act as soon as there is any indication that the employee will need an extension. The chance of successfully extending a visa is much, much greater three months before a visa expires than it is three days before it expires and many headaches can be avoided by acting early. In most cases, an employee’s spouses and children will also be eligible for an extension. An attorney can assist in completing the required Form I-539 and compiling the necessary supporting documents for their extension of status request. Generally, you must file to extend your status before your current status expires. However, an exception may be available to those who are out of status if they can show that the delay in filing their application was due to extraordinary circumstances beyond their control. One example might be ineffective assistance of their prior legal counsel, or extreme illness or injury. As with all extensions, a request for a Nunc Pro Tunc extension of status should be made as soon as possible. If you are in the Houston area for employment on a nonimmigrant visa, or you are an employer with an employee here on a nonimmigrant visa, and yourstay needs to be extended past the expiration date, it is absolutely critical to take action. Once the legal status expires, the situation becomes much more difficult. Kathryn Karam is a skilled Houston employment-based immigration attorney who assists workers with extensions of status. Call Karam Immigration Law today at (832) 582-0620 to schedule a consultation.